The first sign of cold weather calls me to somewhere warm. Instead of somewhere tropical though, a girlfriend and I packed our bags for 10 days in sunny Portugal earlier this October. Our first stop was the beachside town of Lagos in the Algarve. I’ve seen so many Instagram photos this past summer of Lagos with its jagged rocky beach formations and it did not disappoint. From the Lisbon airport, the best way to get to Lagos for us (without a car) was to take the 4-hour train towards Faro. After checking into our AirBnB, we managed to arrive just in time to catch the sunrise on the short 10 minute walk into town. Our AirBnB at was actually a part of a cluster of other villas, and we were pleasantly surprised to find there was even a 24-hour reception area that we were able to request extra beach towels and regular towels from. Especially crucial was their assistance in calling a local taxi service at 7:00AM to catch our train back to Lisbon (when there was only 1 Uber showing in the entire town!). 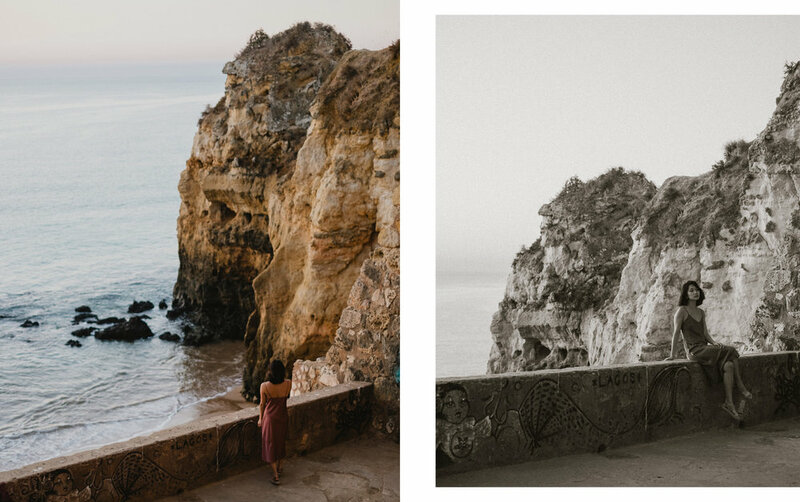 After a fabulous first dinner at Restaurant Reis (get the Algarve-style grilled swordfish, you won't regret it), we began our next day early in order to catch the sunrise. Originally we planned to walk to Praia do Camilo (about 30 minutes away) but 10 minutes in, we realized we would never make it in time. We ended up at Pinhao Beach instead and let's just say it was still every bit as magical, watching the red sun appear over a perfect ocean horizon. I have to say my top sunrise experiences are still on Hawaii though (Haleakala on Maui and Lanikai Pillbox on Oahu), but Hawaii just holds a special place in my heart (hoping to cross Kauai off the list in 2018!). 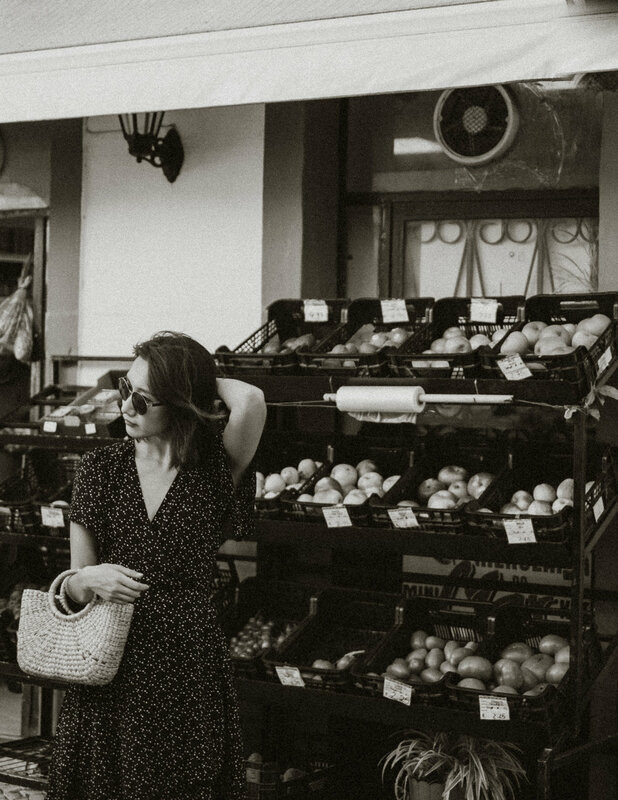 Wearing Aritzia dress (similar here) at sunrise. After watching the sunrise, we finally made our way over to Praia do Camilo. One thing I would note is that we didn't realize nothing would be open before noon outside of town, so needless to say we were not prepared after watching the sunrise sans breakfast. What ensued was an exhausting and hunger-filled 2 hour nap on the beach at Praia do Camilo until the nearest restaurant opened! Note to self: do not plan to climb back up 100 steps when in dire hunger. Looking over Praia do Camilo. Climbing the 100 steps down to Praia do Camilo. We continued our walk after lunch, heading westward along the beautiful Algarve coast. Unfortunately, most of the walk takes place on an inner path but the view at each beach lookout point is completely worth it. It was another 10 to 15 minutes before we reached Ponte da Piedade, the postcard view of the Lagos coastline with a splendour of rock formations rising from the ocean. Although walking in the 30-something degree heat took its toll on us (we definitely did not drink enough water), by midday all these beach spots had become increasingly crowded. We saw so many cars trying to find limited parking and eventually turning back, and were so glad we didn't need to deal with that. Ponte da Piedade was probably the most crowded of all the beaches we'd been to so far. You can't see or tell in these pictures, but a few meters away from me is hoards of tourists trying to get their shot too! Understandable, this view is definitely not to be missed. After taking in the sights, we agreed unanimously to take an Uber back into town. It was just too damn hot. Wearing Aritzia dress (similar here and here), Soludos sandals, and Etsy bag. Compared to our first full day, our second (and last day) was a lot more relaxed. Given it was only our second day and we knew we had lots of city walking ahead of us in Lisbon and Porto, we decided to take it slow the next day. We originally had booked a boat tour to take in the Lagos-Algarve coast from sea, after having seen most of it from land the previous day, but rough conditions on the sea resulted in the tour being cancelled. Definitely something on my list for next time. We instead ended up spending the morning wandering around the historical town centre, getting aimlessly lost in all the charming, pastel, and tiled alleyways. It almost feels like the sun hits the buildings in a different way, because you never see this type of lighting in Toronto (especially not during the harsh midday light). Exploring the historical town centre in Club Monaco top (similar here and here), Sylvie & Shimmy trousers (similar here and here), Soludos sandals, and Etsy bag (similar here). Wearing Popcherry dress (similar here and here), and The 5th Co sunglasses. Eventually we made our way back to the beaches (of course), this time hitting up at a leisurely pace: Batata Beach, Praia dos Estudantes, and ending our day at Praia Dona Ana to catch a beautiful sunset. The rock formations painted golden and the ocean dyed turquoise, not a bad conclusion to our last day in Lagos. The next morning, up before sunrise again and a shade or two darker, we were off to Lisbon. Stay tuned for posts on the rest of my Portugal trip! Photos by yours truly, those of me are by my friend, Julia. Disclaimer: All opinions and creative direction are my own.